[UPDATE 2014-02-16] For an introduction of vCAC other models have have a look at Investigating vCAC 5.2 Models. 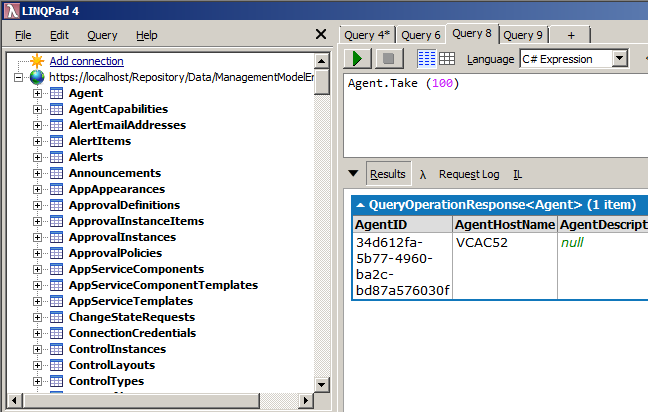 From there you can use the object “DynamicOps.ManagementModel.ManagementModelEntities” and its methods and properties to your needs. For example you could use it to update custom properties on a virtual machine or lookup information from agents and endpoints. All of this can then be used inside a vCAC workflow and a PoSH script that can be invoked via InvokePowerShell as described in “Powershell Scripting from vCAC Workflows (Southbound)” (make sure you read the comments to that post to make the example work). One side note about how to use the object. Most entities are “linked” together. So if you want to add a new attribute to a property you have to create an PropertyAttribute object and the link it to its base Property object via “SetLink()”. When accessing objects (eg via $mgmtContext.GlobalProperties) you have to “detach” the objects via “Detach()” after use or you get strange results when the objects have been changed in the background.